Ashely and Russell Miller pass over a new steel trestle bridge in Maynard that is part of the Assabet River Rail Trail. MAYNARD — A 10-foot wide ribbon of asphalt snakes past townhouses and colorful shops before crossing a dedicated bike and pedestrian bridge over the Assabet River where the Boston & Maine Railroad used to pass through town. The clocktower of the old mill comes into view at a newly painted crosswalk where the latest installment of the Assabet River Rail Trail crosses Main Street and continues south toward Stow, Hudson, and Marlborough. “A year ago, you could still see the ties and spikes that were left behind when they pulled the rails up,” said Maynard Assistant Town Administrator Andrew Scribner-MacLean, who expects the path to draw more foot traffic into local businesses even before construction is slated to end next spring. “There are 14 restaurants downtown and seven different ethnic cuisines and a movie theater. I would hope someone could ride through on the trail during the day and come back with the family later that evening,” he said. But it is the asphalt headed three miles north out of Maynard that has bicycling advocates and transportation planners excited: The Assabet River Rail Trail now connects Maynard to the commuter rail station in Acton, creating one of the latest links in Massachusetts’ growing network of offroad transportation alternatives. New parkway designs that separate cyclists from cars reflect a changing approach to transportation. 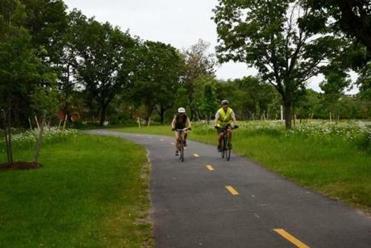 Massachusetts has 927 miles of off-road multi-use paths either in use or under construction plus 821 miles under design, according to DOT figures. Also, there are 934 miles of painted bike lanes and other on-road facilities either in use or under construction, plus 2,226 more miles under design. And all those projects add up. Over the last decade, the state has spent $150 million building out the trails coming to fruition today and plans call for investing at least as much money on trails over the next 10 years, said Dan Driscoll, director of facilities planning for the Department of Conservation and Recreation. “It has been pretty amazing,” Driscoll said. 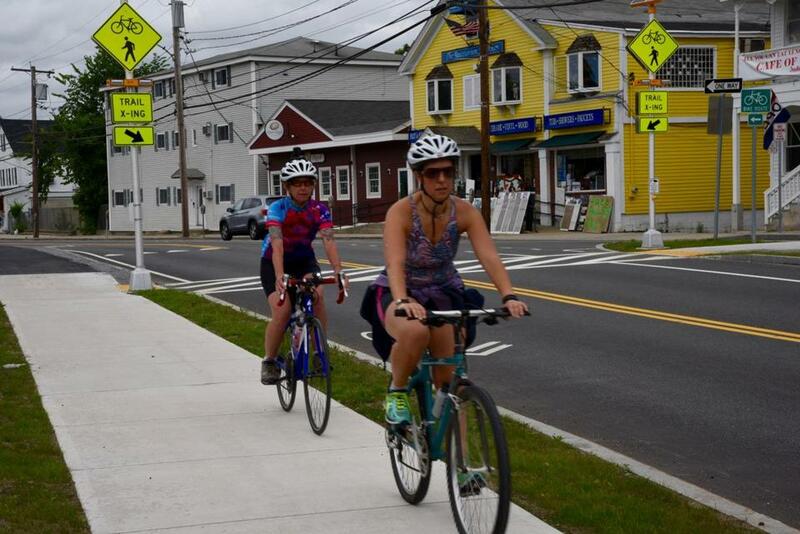 Cyclists ride into downtown Maynard along a new stretch of the Assabet River Rail Trail. 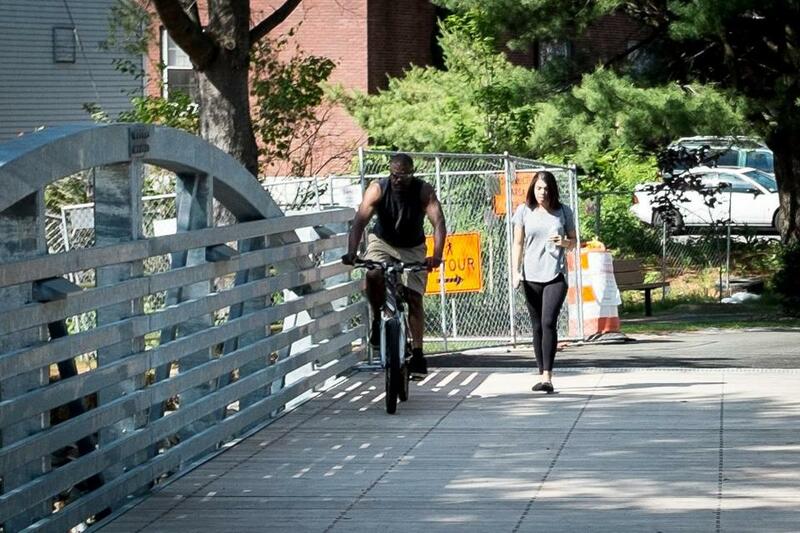 Much of the focus has been on creating family-friendly greenways suitable for strolls, runs and bike rides for all levels of ability, but planners now are looking at connections between paths, including a Watertown-Cambridge link between the region’s oldest and most popular bike paths, the Minuteman Bikeway and the Charles Dudley White Bike Path along the Charles River. “Surveys have found less than 10 percent bicyclists nationally feel comfortable even riding on bike lanes on the road. We are trying to focus on being more family friendly and novice friendly and give people a place to ride where they are completely separated from the motorway,” Driscoll said. At the Metropolitan Area Planning Council, senior transportation planner David Loutzenheiser heads a project looking at how to connect all those bike and walking paths. In Wellesley, for example, an aqueduct trail leads over the Waban Arches viaduct, but deadends at a barbed wire fence where the trail leads to private property. MAPC has created an interactive trail map (trailmap.mapc.org), which allows users to find not only rail trails and walking paths but viable connections along streets — many already with painted bikes and Share the Road signs. Wayfinding signs are the next step, Loutzenheiser said. The state also maintains a website with links to each trail by region. While construction continues on the $6.7 million Assabet River trail extension, including the completion of a 200-foot wooden boardwalk over wetlands along Route 27 and paving around the South Acton MBTA station, similar projects are advancing across the region. In Acton, the state is nearly finished building a bike bridge over Route 2A along the Bruce Freeman Rail Trail, which starts in Lowell and follows the former New Haven Railroad’s Framingham & Lowell line south. 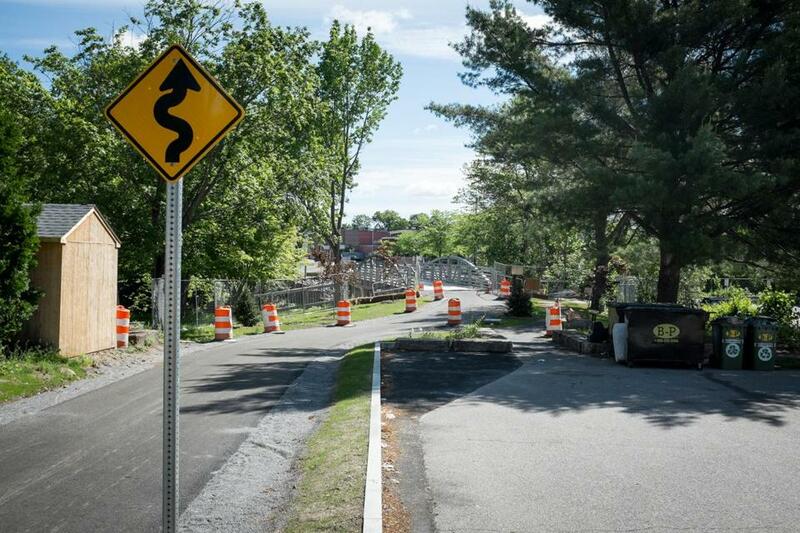 Another bridge over Route 2 is awaiting construction and work already has begun on a third bridge crossing the Assabet River. There are plans to build a new rail trail between Leominster and Fitchburg, possible extensions of the Northern Strand Trail on the North Shore and the Ashuwillticook Rail Trail in Western Massachusetts. Residents in Dover last month authorized the board of selectmen to enter into a lease with the MBTA to build a rail trail along part of the abandoned Bay Colony Railway. Needham opened its stretch of trail along the same corridor last year but current plans do not include a connection. Meanwhile, the towns of Wayland and Weston are working with Eversource Energy and the DCR to rip out four miles of weed-covered tracks along the former Massachusetts Central railway to build a paved trail that would double as an access road for powerlines overhead. The trail already is widely used by walkers, runners, bikers and equestrians, with dirt tracks crossing back and forth over the retired rails that run from Route 27 near Wayland Center east to a rusty trestle bridge over an active rail line near the Waltham border. Construction cones mark the new steel trestle bridge over the Assabet River as finishing touches are being put on the Assabet River Rail Trail. The Massachusetts Central Rail Trail is considered a priority by the state and could eventually stretch 26 miles from Berlin to Boston. Eversource plans to build a gravel access road for maintenance along the Weston-Wayland segment that is under lease to the DCR from the MBTA. DCR will pay for the paving. The Mass Central line is less popular in Sudbury, where residents oppose plans to link building the rail trail to a proposal from Eversource to bury 7.6 miles of new transmission lines along the railway to tie into a power station in Hudson. Last month, hundreds of residents packed a hearing of the Energy Facilities Siting Board to voice their opposition to the Mass Central plan just weeks after overwhelmingly voting to approve funding to design Sudbury’s portion of the Bruce Freeman Rail Trail. The two bike paths would intersect in Sudbury at what is now a crosshatch of steel rails in the woods off Union Avenue and Station Road. The Mass Central line runs east to west; the Bruce Freeman runs north to south. Eversource spokesman Michael Durand said the company is trying to fill a critical gap in the regional power grid identified by ISO New England and already has scaled back the width of the corridor to be cleared by offering to bury the lines rather than build towers. However the powerline controversy pans out, cycling advocates see Sudbury as a major crossroads for the state’s trail network. Jose Martinez can be reached at martinezjose1@mac.com.